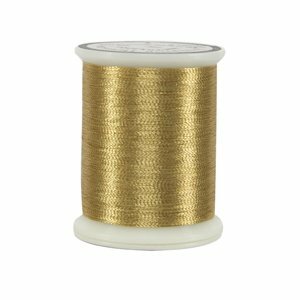 #40 Metallic thread. 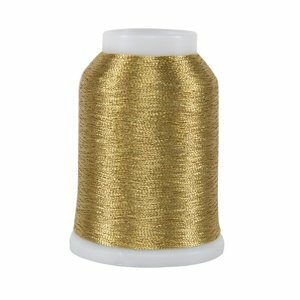 Designed for Embroidery, Quilting, and Decorative Stitching Create beautiful designs with Superior Metallics thread. In stock are 8 beautiful colours, plus two variegated colours. Use a Superior’s Topstitch #90/14 needle and reduce the top tension to 1.0 and Superior Metallics is guaranteed to work. What makes Superior Metallics so superior? Not only do we use the finest raw materials to create this beautiful thread, it undergoes special processing to make it vibrant, strong, and smooth. - The only metallic thread with a guarantee to work. Longarm Machines: #18 (MR 4.0). Reduce top and bobbin tension. Not sure which gold you need?